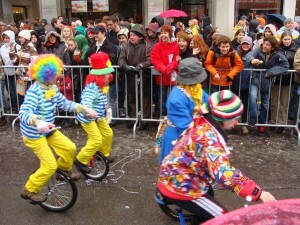 Today was a half day holiday for schoolchildren and most businesses, as the country celebrates Fasching or Karnival. This is the festival the day before Lent starts, an interesting crash between pagan and Christian mythologies, where people can get their drinking, eating and partying in before the 40-day deprivation begins. 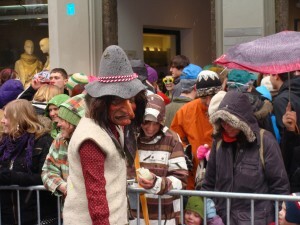 The other main focus of Fasching is driving away winter. Some wear scary masks or bear costumes to represent winter, while others play instruments, wear bells and noisemakers, or have mirrors on their heads to scare winter away. Kids get dressed up in costumes similar to those seen in NA for Halloween, with princesses, pirates and clowns being the obvious favourites. We went over to Aunt Susi’s and Lili’s last night and borrowed a very cute ballerina costume. Mostly I really don’t like organizing costumes, either for myself or for others; but the upside today was that Annie was so excited to put on the costume that she was easily dressed, including letting me put up her hair. Annie has been so difficult to get dressed the last few weeks, that when Markus returned from Canada last time I told him that it was his responsibility to see to that duty in the morning for, like, the next 10 years. Here are the sweet pictures of the little ballerina. Students Rebecca’s age don’t really get dressed up anymore, but she and I went to watch the parade for an hour or so while Markus worked in the Cafe. Unfortunately the weather wasn’t very good, lots of snow, very slushy and chilly, but that didn’t seem to stop the crowds. The legal open alcohol for anyone over 16 certainly helps with the festive atmosphere, I’d say. There was a real range of traditional and modern floats and bands. There were scary masks, children riding unicycles, and beautiful costumes. I think my favourite had to be the Austrian drag queens, but I’ve always had a soft spot for that sort of thing. I grabbed my regular camera instead of the video camera, so unfortunately the quality of the following could be better and I can’t edit it to make it shorter (only 1 minutes, but still.) 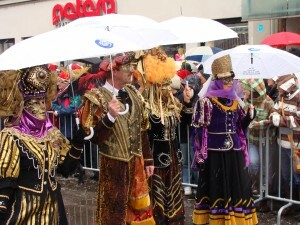 But it does give you a sense of one of the main themes of the festivities, driving winter away and ushering in spring. Fasching Umzug from Hillary Samson on Vimeo. Twice since Markus has returned home, we have gone tobogganing at night. Yes, at night. The walk up was beautiful both times, but especially the second time, with everything dusky and quite with new snow. We had a tasty dinner at a little lodge at the top, where the woman serving us vaguely remembered Markus from his younger days, as they used to live in the neighbourhood and went up that hill a few times a week. Then the crazy part began. Markus had thought there would be a full or near full moon, but both times it was too cloudy to the let the moonlight through at all. Although brother Andy informs me that if there is snow it isn’t pitch black (and that I just need more alcohol), it seemed pretty dark to me. As you can imagine, this isn’t my favourite activity. I pretty much avoid/hate anything that has even a hint of physical danger. Those of you pooling your money to buy me that skydiving course for my upcoming 40th will just have to think of something else. The first time was the worst, as the track was quite slippery, and there were times I just couldn’t go slow enough for my comfort. I had scouted out the drops off the side of the mountain on my way up, and although I couldn’t see them, they loomed large in my imagination. I stuck to the inside of the track, thinking that I was probably better off smacking into a tree than hurtling into the unknown. Obviously, this really isn’t as dangerous as I am making it out to be, as the second time we were there several families with children were coming down as well. However, they all seemed to have flashlights. A good idea I’d say. The second time there was more snow and so I could just go slow. Very slow. It really isn’t that much fun, but better than the alternative (fast and crapping my pants.) 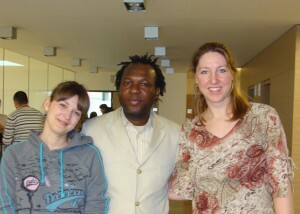 But of course Annie, Rebecca and Markus had a good time, so I have a feeling we’ll be going again. Dad’s Home January 2009 from Hillary Samson on Vimeo. 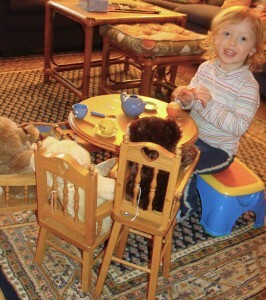 This morning Annie was playing with Grandma Susan and Grandpa Ken’s Teddy Bear Picnic set that they sent for Christmas, setting the bears in their place and pouring tea. Except it wasn’t tea. She informed us definitively that the bears were having Kaffee, said with a distinct accent. Too hilarious. And those of you following Facebook already know that the other day Annie corrected my pronunciation. When she likes something she is eating she says “lecker!”, which probably translates best as tasty or yummy. I said it back to her and she got a little Samson scowl in her eyes and repeated the word in her perfect, guttural Tirolean accent, trying to teach me the correct pronunciation. Rebecca and I had tears running down our cheeks we were laughing so hard. 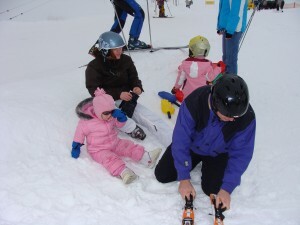 And of course, nothing is more Austrian than skiing. 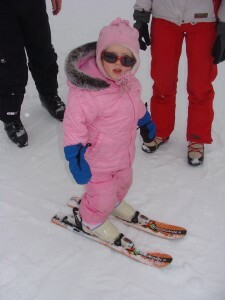 Annie had her first crack at it yesterday at Seegrube. 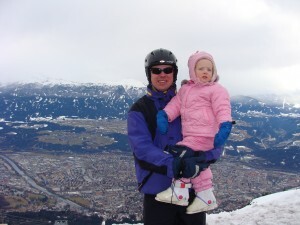 It is a beautiful mountain less than 30 minutes by bus and gondola from the Develo door to the top of the slopes. Honestly, it was a pretty much a flop ending it tears after only a couple of minutes. However, I was very quick with the camera and so was able to make it look like she was having a great time and a successful experience. Better luck next year. Rebecca and Markus had a good couple of runs though, and I’m going to try to hit the slopes on Wednesday if the weather is good. Setting up. 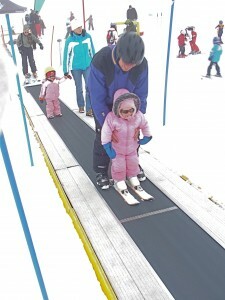 How little are those skis?! 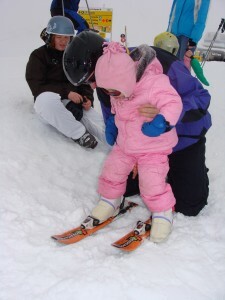 Annie’s Very First Ski Run from Hillary Samson on Vimeo. 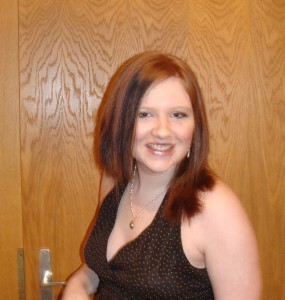 Last week Rebecca attended her first ball. Balls are a very big deal here, with students usually taking several weeks of traditional ballroom dancing. Rebecca hadn’t signed up for these, but she was in the orchestra playing the music for the dancers with her viola. The weekend before I was going to go with Rebecca to dress shop, but my wicked flu kept me down. So Dad and the two girls went out and found Rebecca a pretty dress for a reasonable price. Rebecca managed to find cute flats to go with the dress for only € 10, and was able to wear the jewelery I made her for her Grade 8 prom, so she did very well in the spending department. I helped with hair and makeup and we had lots of fun getting her ready. Once Annie saw Rebecca, she very shyly and cutely whispered, “I want a dress too.” So we went to her summer collection and picked out a sweet one for her to put on. Of course, pictures ensued. 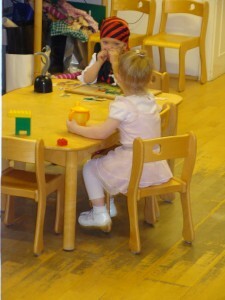 Here is one of the girls and one of Rebecca once she was all ready to go. Rebecca had a great time. There were about 1000 people there, and the Congress was set up with several rooms for various types of music. Rebecca danced for a couple of hours after her orchestra duties were finished. I think she arrived home around 2 a.m., so obviously it was a spectacular evening. I’m glad she had this Austrian experience here with her friends, as there really isn’t anything like it in N.A. Something I hope she always remembers. You are currently browsing the Across The Water blog archives for February, 2009.